I usually don't post about stuff like this but hey I love amazon and I love giftcards. I use those giftcards to buy more books! hehe!! LivingSocial has a GREAT deal today! 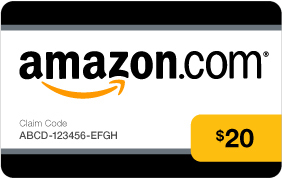 For only $10 you get a $20 Amazon.com gift card! click on the picture for details. Get it now before it expires! The limit is one per person. Yeah I took advantage of this today too. Didn't really have the money for it, but well...it's an extra $10 so I figured I was actually gaining, lol.